KILCHENSTEIN, ALLIE B., 96, of St. Petersburg, died Tuesday (May 2, 2000) at Mariner Health of Pinellas Point. Born in Jewett, Texas, she came here in 1998 from Dallas. She was a homemaker. Survivors include two nieces, Emily Jefferson, Dallas, and Sheila Delfeld Hanes, St. Pete Beach; and two nephews, Donald Sanders, Texarkana, Texas, and Alfred Carter Jefferson, Boston. National Cremation Society, St. Petersburg. Death Removes Mother of Editorial Writer. Mrs. Hattie Elizabeth Jefferson, 73, of 7422 Cortland, mother of B. C. Jefferson, editorial writer of the Daily Times Herald, died Monday. She had been in poor health from some time. 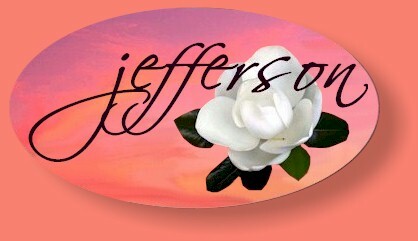 A native of Mississippi, Mrs. Jefferson was the daughter of Dr. and Mrs. J. A. Barnett. Her father served as a surgeon in the Confederate Army. The family moved to Texas, settling in Freestone County, in 1883, and she was married to the late W. C. Jefferson there in 1892. Mr. Jefferson died in 1916 and in 1919 she moved to Dallas and had lived here since that time. She is survived by her son, four daughters, Mrs. Leon W. Sanders, Mrs. Leo W. Delfeld, Mrs. Roy Kilchenstein and Miss Ann Jefferson, all of Dallas; a brother, J. J. Barnett, Teague, and five grandchildren. Funeral services will be held at 4:30 p.m. Tuesday at the Wieland Funeral Chapel. Burial will be in Restland Memorial Park. Pallbearers will be Alex Acheson, Ross T. Fitzgerald, Albert N. Jackson, C. J. Belfeld, E. L. Burks and Robert A. Jackson. Died at Auburnia, her home in Kingston, La., at 7 p.m. Thursday, November 15, 1917, Mrs. Catherine Hoyle Tomkies Beard, widow of Col. James H. Beard, who was killed at the Battle of Mansfield. Mrs. Beard was born July 4, 1835, in Hoylesville, Lincoln county, N.C. She came with her parents, John Francis Tomkies and Margaret Tomkies, to Kingston when quite a young girl, where her father built a beautiful home and where she married and lived and died. She leaves a devoted daughter, Mrs. Robert Hall Scott, from whom she has never been separated; two grandsons, Rembert and Rochell Scott; three great grandsons, Reese, Robin, and Harold Scott, of New Orleans. She also leaves eight nephews and nieces, including Miss Isabell Billiu, who has been almost a daughter; Russell and Garnett Billiu, Goodwyn Tomkies and Mrs. Sallie Tomkies-Lancaster; two great nephews, Tomkies and Sidney Lancaster; one great niece, Anna Virginia Tomkies, and one great-great niece, little Mary Louise Lancaster. Before the Civil War Mrs. Beard lived in Shreveport, her husband being in business (t)here, her home being the present Leman home. Mrs. Beard has been an invalid for a number of years, caused from a fall. She was a person of wonderful charm and possessed a remarkable memory. She never grew old in her thoughts or mind. She felt the greatest interest and pleasure in her relatives and friends and took the keenest interest in all the questions of the day. She was a devout member of the Presbyterian church and a member of the U.D.C. The Kate Beard Chapter of Mansfield is named for her. She was laid to rest at 3 p.m. Thursday, November 16, 1917, in Evergreen cemetery. The pallbearers were: L. S. Frierson, Bemis Scott, Ashton Scott, James Scott, Hersey Riggs and Garnett Billiu. Many beautiful flowers proved the love of friends. She will live always in the hearts of her family and her friends. Mrs. Lema Evelyn Tomkies. 70, of Thurmon' s Convalescent Home, a resident of Amarillo for three years, died at 5:55 a.m. today at the home. A native of Gainesville, Mrs. Tomkies was the widow of Dr. James S. Tomkies, a Dallas physician. She was a member of the Lakewood Presbyterian Church in Dallas. Funeral services will be held at 10 a.m. Saturday in the chapel of the Ed C. Smith Funeral Home in Dallas. Burial will be in the Restland Cemetery in Dallas. Amarillo arrangements were by: Blackburn-Shaw Funeral Directors. Survivors include a daughter, Mrs. Charles E. Phillips of Fullerton, Calif.; four brothers M. E. Jenkins of 709 Sunset, W. H. Jenkins of 4623 Brown Ave. G. Carl Jenkins of 1307 Avondale, all of Amarillo, and C. C. Jenkins of Denton; three sisters, Mrs. Matson Jones of Gallup, NM., Mrs. J.T. McIver of Hereford and Mrs. Vernie Craig of Miami, Tex., and one grandson, Wayne Scott Phillips of Fullerton. Genevieve E. Moak passed away Oct. 25, 2007 at the Coronado Home Hospice Care Facility. A memorial will be held on Nov. 10, 2007 at 10 a.m. at 1950 E. Galveston, Chandler, AZ at the LDS Church on the N.E. corner of Dobson and Galveston. She was born on Oct. 21, 1923. Genevieve was a member of the Church of Jesus Christ of Latter Day Saints as well as the Senior Citizen Quilting Group located in Chandler, AZ. She was a loving Mother and Grandmother. She had a spice for life and such a fighting spirit. She has left us in body but will always live on in our hearts and memories. She is survived by Daughter, Marian Shields of Chandler, AZ ; Sons, Nelson A. Moak of Springville, UT; R. Wayne Moak of Phoenix, OR and Walter E. “Pete” Moak of Chandler, AZ; Brother, Earl E. Elliott of Haughton, La. ; 27 Grandchildren; 63 Great Grandchildren and 2 Great Great Grandchildren. NEWELL ANN BURKE, 89, passed away Wednesday, January 28, 2004 at a local hospital. Born September 20, 1914 in Houston, she moved back to the Houston area in 1975. She was a member of the First Christian Church in Freeport, the TSTA as past president, AARP and the Retired Teachers Association. She taught school at Brazosport High School and Brazosport Community College. Survivors include a daughter, Barbara Burris and husband Charles of Sugar Land, a son John Webb and wife Kaa of Denver, Co., 2 sisters, Betty Briscoe of San Antonio and Cookie Dixon of Florida, 4 grandchildren and 6 great grandchildren. Graveside services will be held Saturday at South Park Cemetery in Pearland, with Dr. Paul Cline officiating. In lieu of flowers the family requests that donations be made to Parkway United Methodist Church, P. O. Box 982, Sugar Land, Texas 77478. Temple - Mrs. Mattie de Grummond, 93, prominent resident of this section, died last night. Survivors include a son, Harry de Grummond of Temple, and a nephew, Herbert Jefferson, of Dallas.